Accepted into the Google Glass Explorers Program! About a month ago Google was looking for people to test their Google Glass and asked the public to submit their ideas to #ifIhadglass via Twitter or Google+. So I submitted an idea. Most people had grand, exciting schemes: jumping out of airplanes, helping veterans, recording important events for their relatives. My idea was pretty utilitarian: I conceived of scanning recipes, making shopping lists, going to the supermarket, being instantly informed of coupon items, sales, etc. 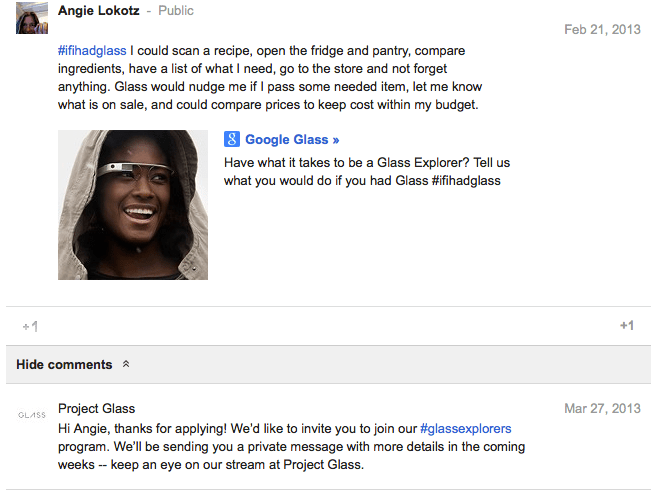 Imagine my surprise at opening my gmail to find out I had been accepted as a #glassexplorer! Perhaps Google saw an opportunity to tie their Glass to their Google Wallet in a grocery store setting. Imagine being able to scan the barcodes for your items, place them in your bag, and simply beam your Glass at the cash register reader on your way out? The register would read your data and debit your account. Done deal. I know most people think of a camera when they think of Glass, but it will be fun to see what other things we #glassexplorers can dream up. You can follow along at Project Glass on Google+.